In the past couple of months I was able to try ANNEMARIE BÖRLIND Skincare, a natural skincare line from Germany that was developed in the Black Forest with ground breaking research. They stand for natural cosmetics with proven efficacy which has been developed from singular raw materials through innovative and sustainable action. The products contain plant extracts, come from certified organic farming, have deep spring water and are free of animal extracts. I tried the Regenerative line, for more mature skin that is aging and needs ingredients that will help halt the aging process and reverse it. The products I tried are a Regenerating Cleanser, Blossom Dew Gel, Day Cream, Night Cream and Eye Cream. 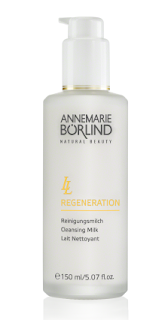 A very gentle and soothing cleansing milk that cleanses the skin and restores lost oils. For mature skin over 30. This cleansing milk has been especially formulated to meet the requirements of a dry, poorly moisturized skin. It gently removes dirt, impurities and makeup. Caring botanical ingredients protect the skin from drying out and prepare it for subsequent skincare. To use: Apply to the face, throat and décolleté and allow to work for 30 seconds. Remove with a dampened washcloth and rinse with lukewarm water. Skin will feel refreshed, soft and supple. I really liked this cleanser and usually I am kind of lukewarm on cleansing milks. I usually prefer cleansing gels. I like a good foam to know I am getting all the dirt, impurities and makeup from my face. However, this cleanser did not disappoint. It definitely cleansed the skin impeccably and made it feel soft and supple without leaving it feeling dirty or oily. The is another thing I really liked about this cleanser, skin is not left feeling oily afterwards. A refreshing and astringent toner for mature skin over 30. This extraordinary gel intensively moisturizes dry, poorly hydrated skin, leaving it noticeably refreshed. Skin is softer, smoother and does not feel taut any longer. To Use: Gently pat onto cleansed skin of the face, throat and décolleté. Then apply day or night cream immediately. I love this product. It tones skin all the while moisturizing it at the same time. It is an astringent product yet it hydrates the skin. It is a very interesting product. Skin is left feeling soft and supple afterwards and not dry and taut, as with most astringents. It must have the right balance of ingredients that allows skin to be cleansed, moisturized and toned with one touch. I use this right after cleansing and right before I moisture. Normally I don't like toners so much, but this one is different and I definitely like this one more than any other I've tried. This intensive day protective cream has the highly effective LL Bio-Complex. Proven to support the natural regeneration of dry, poorly moisturized skin, the complex works well on dry, mature skin. It is ideal as a base for makeup. Use in the morning. Apply to the face and throat after cleansing and toning. This product does not claim a sunscreen but I have looked at the ingredients and it has zinc oxide in it. Zinc oxide acts in two ways, it acts as a sunscreen and it acts as an anti-inflammatory. I am wondering if it is here as the latter of the two in this case. Like the second one. However, to be a truly anti-aging product I do think it needs a sunscreen. 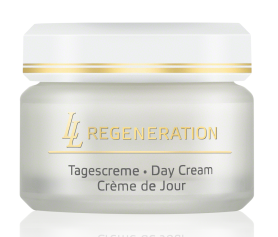 All day creams need a sunscreen if they are gong to be a true anti-aging product. Otherwise, this cream is very thick and heavy yet sinks into the skin easily. It has a wonderful honey fragrance that is lovely. Where it has been applied skin feels soft and supple. That lasts the majority of the day too. This cream contains valuable herbal extracts and the LL Bio-Complex that have been proven to support the natural cell renewal and also have an oil-restoring and moisturizing effect on dry, poorly moisturized skin. 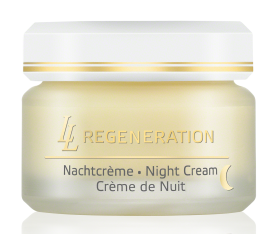 Skin regains its freshness and elasticity after using this Night Cream. To Use: Use in the evening. Apply to face, neck and décolleté after cleansing and toning. The Night Cream is also very heavy. After application skin feels like it has a cream on it. It does sink in, just not as quickly as the Day Cream. This is because it is a heavier cream. Night Creams are supposed to be more protective to the skin and can be heavier. This one also has a wonderful honey scent too, like the Day Cream. It makes the skin feel soft and supple, moisturized and downright pleasant. It is one of my favorite creams. 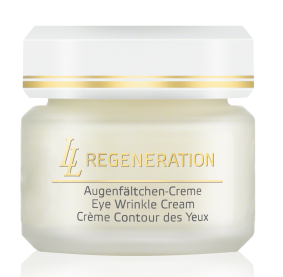 This eye cream smooths and refreshes the stressed tissue around the eyes. After weeks of use, the appearance of fine lines and wrinkles, as well as dark circles and bags around the eyes are noticeably reduced. To Use: Apply mornings and evenings to the cleansed skin around the eyes. Pat gently with your ring finger on the areas above and below the eye. Make sure not to get into the eye. Do not use too much, just a little bit. I love this eye cream. It is one of my favorite products. It really does work well. I noticed some wrinkling under my eye, and some bags that were starting to form and this product took care of them in just a few weeks. The ingredients in this product read like a bill for a law company it is so large. But, whatever they have put into this product is worth it because it is really good. This also has that delicious honey scent that the other products have. ANNEMARIE BÖRLIND is sold online in the United States at www.boerlind.com/us/. Like ANNEMARIE BÖRLIND on Facebook: https://www.facebook.com/AnnemarieBorlindUSA and Follow ANNEMARIE BÖRLIND on Instagram: https://www.instagram.com/annemarieborlind_usa/.